Toronto – That’s right, this concert was so good we’re reviewing it twice. And since Allison did all the hard work of actually writing about the details of the show, I can go off on bizarre tangents and whatnot. Speaking of time, I will now fold time back upon itself and talk about the opening acts. I arrived during Tokyo Police Club’s set. I think I caught most of it. They were good, but didn’t seem quite suited to playing such a large venue. That said, they put on a pretty high energy show. Too bad they played to kind of a sparse crowd. Spoon were up next and while their stage show was nowhere near as flashy as that of The Flaming Lips, they made up for that in songcraft. Tunes such as “I Summon you,” “I Turn My Camera On,” “Don’t Make Me A Target,” and well, pretty much every song came across great live, even if Britt Daniel didn’t shoot lasers from his eyes while unicorns popped out of oversized wedding cakes. 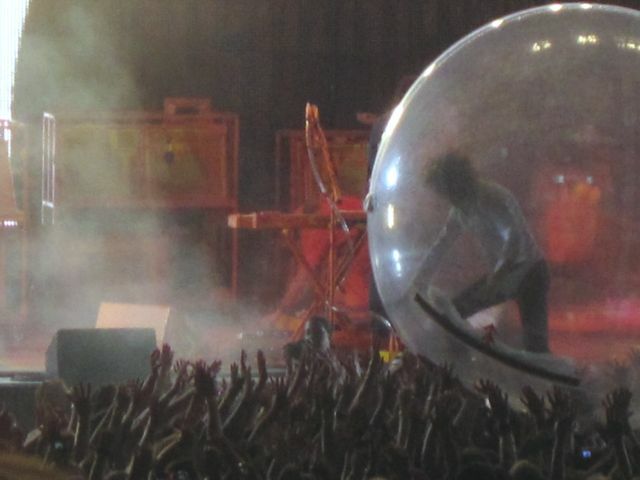 (Note to Flaming Lips: you can totally use those ideas for your next show. I don’t need the credit, seeing cake unicorns in action is thanks enough) They didn’t play “Got Nuffin,” which is one of my favourites from Transference, but I’m willing to let that one slide. 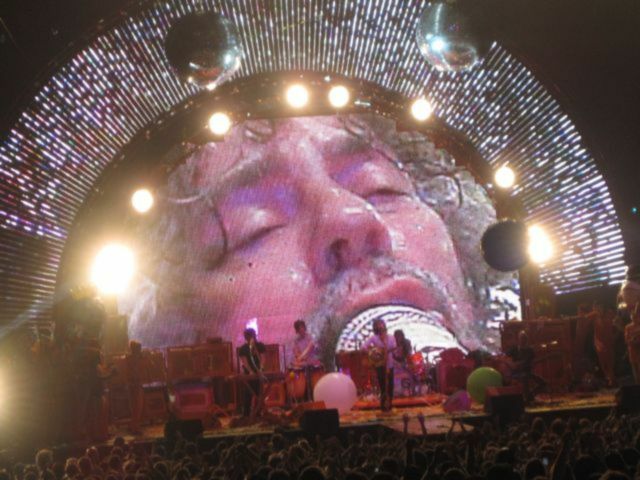 And now back to the adventures of the wizard Wayne Coyne and his band of sonic adventurers. Speaking of wizardry, I began to imagine during their set that Coyne was in fact the great and powerful Oz as I watched his giant head projected onstage behind him. “Pay no attention to that man on stage! He’s not singing, I am! And I can stop time! And summon caterpillar kings and catfish cops and guys in bear suits!” Either that, or Wayne Coyne is Big Brother. Big Brother is watching you … but he’s cool. And he’s smiling. If Wayne Coyne was in charge of Oceania, Winston Smith might not have had a reason to rebel. And Room 101 would be full of videos of naked ladies dancing. Oh, and everyone, I mean everyone, would be wearing orange. Coyne may be an all powerful being in contol of space and time, but even he can’t stop the war in Iraq. “We know that playing a song isn’t gonna end a war,” he said by way of introduction to a lovely rendition of “Taps” that the band played near the end of the set. But he did encourage the entire crowd to form peace signs and raise them in the air so as to “shoot energy” out into the cosmos or something. It was like we were all part of some awesome magical ritual. I’d like to believe that we did all shoot some energy out of our fingers. Sure it didn’t end a war, but I’m certain it made the world a better place somehow. A place full of confetti and balloons and good vibes. i have to say, do you realize was one of my favorite concert song moments ever. It has been 2 days and I’m still thinking about this show. Wayne Coyne has a piece of my heart. Maybe he is the Wizard of Oz. This show is something I will never ever forget. Bordering on spiritual awakening, it transcended beyond anything I have ever seen before and I truly believe that seeing the Flaming Lips in concert can make you a better human being! Thank you to all in the audience for bringing out your enthusiasm and sharing your love with all of us!!!! Wow, just look at you kids. You’re gushing like little school children! Considering how many live shows you’ve all seen, that says a lot. Now I wish I had gone! 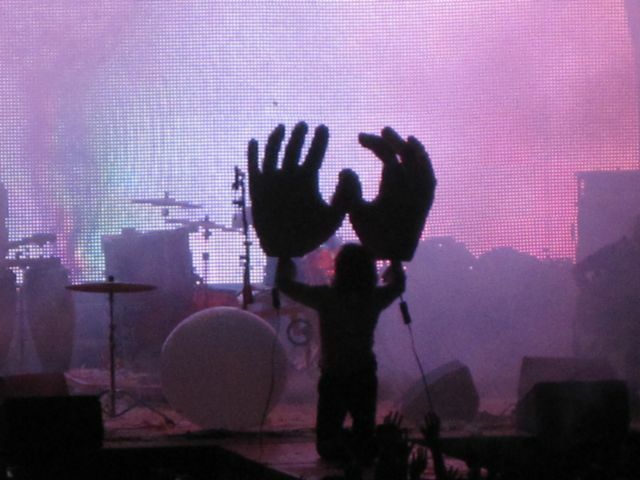 Fact: seeing the Flaming Lips live will make you less jaded. FACT! oh jags. im sure they’ll be back at some point in the future. i don’t know. I can be pretty jaded when I want to be. 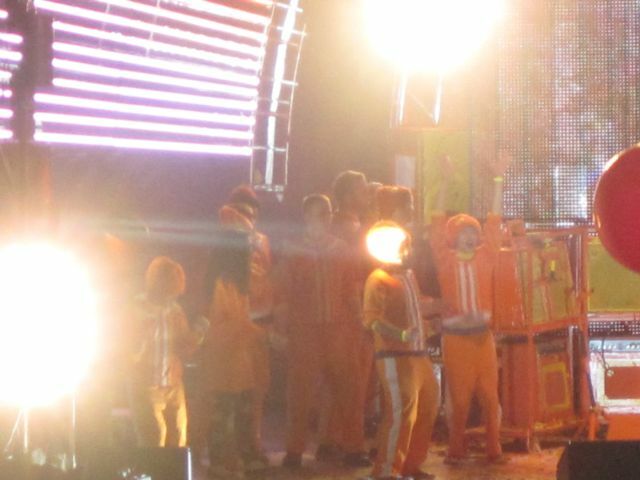 I have this theory that everyone was impregnated with Wayne Coyne’s love child that night.